The amount of personal debt is now equal to our entire GDP. That’s some £56,000 per household. At the end of 2007, total personal debt (mortgages, loans, cards etc.) stood at some £1,408 Bn. I would be interested to hear the views of Centre Right readers on this state of affairs - and what we might do about it. 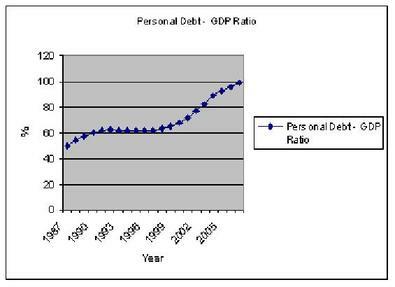 Ten years ago, personal debt was only 60% of GDP. To put that in perspective, if personal debt had stayed at 60% of GDP, it would have been a much more affordable £34,000 per household. That level of debt would mean that fewer people would go broke or lose their homes in the event of a downturn. 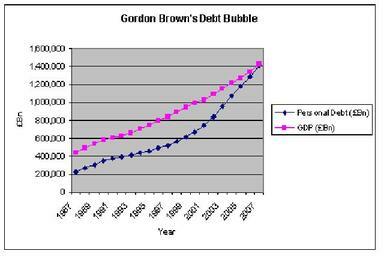 This little series has so far looked at how Gordon Brown has plunged the public finances into chaos. So we are really badly prepared for a downturn as a nation. Yet this pales in comparison with his failure to regulate the banks or keep personal debt to responsible levels. Our personal finances are as broken as the public finances. As individuals, we are really badly prepared for a downturn. These figures are just horrendous. The graphs below tell their own story - Labour have done it again and we are all going to pay the price . . . I am indebted to Andrew Lilico for his help in compiling these numbers. > Previous entries in this 'Labour's economic mismanagement' series: (I) Debt, (II) Taxes and (III) The Fiscal Price.